I have been blogging about creative portfolios recently, with the notion of ‘standing out from the crowd’ as my backbone. This is also relevant to CV’s. Just like a portfolio, you have to stand out from the crowd to get noticed! 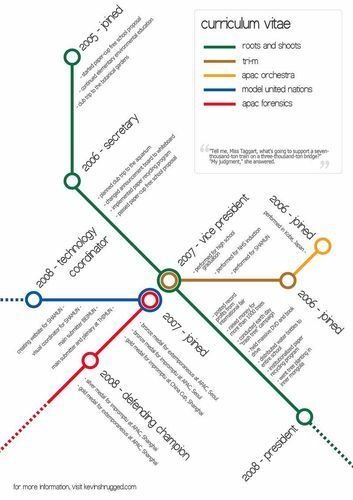 I came across two fantastic CV’S which mimic a London tube map, and instead of different stops, each coloured line represents a category such as qualifications or education and each ‘stop’ is what the person has achieved or what skills they have or what clubs they belonged to. On Jonathan Kaczynski CV, the Piccadilly line has been transformed into ‘Education ‘ a timeline reflecting his progress throughout education and the ‘Circle line’ shows off his extra curricular activities, wheres as the longer ‘District line’ demonstrates his computer skills. 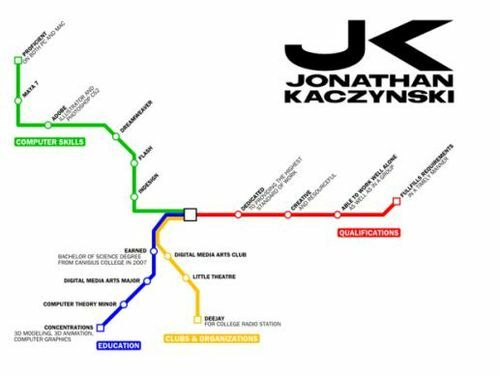 However, each line on Kevin Wang’s ‘tube map CV’ reflects places he has worked instead of different categories like Kaczynski’s. It doesn’t matter which way this format is set up, I’m a fan either way! Just how the purpose of a tube map is to figure out how to get you to places, one destination to another, this format for a CV I feel may reflect the same purpose – moving from one job to another, trying to gain more and better skills to get yourself to that next destination – a higher paid job or to become more qualified . An interesting concept, one which I may use myself in the future.